The Chick: Lovie Lane, a.k.a. "Lovie Lamonte," a.k.a. "Mrs. Laura Foster." Sold to a brothel at age eleven, she eventually earned enough money on her back to escape that wretched life and open a boardinghouse as a respectable "widow." The Rub: While the small Texas town of Glory thinks she's genteel lady, she knows they could never understand her past, especially Brand, a kind-hearted preacher who deserves better. The Dude: Reverend Brand McCormick. He thinks good Widow Foster is the bee's knees, and knows she likes him back despite her bizarre reluctance. The Rub: Unfortunately, when the son he never knew he'd had decides to show up, leaving his reputation in tatters. Will the good widow still have him? Evil Uncle: What am I supposed to do with my orphaned, non-denominational Irish nieces? Laura: I am a refined widow. I run a respectable boarding house. I love children and animals. I'm totally not a seasoned prostitute. Did I mention my excellent taste in home decorating? I'm so not a whore. Brand: I'm a charming, pious preacher. I have two adorably mischievous kids. I think I love you. You're totally not a seasoned prostitute. Did I mention I'm a widower? You're so not a whore. Wanna date? Brand's Kids: *sad eyes* Please date our dad! Brand's Secret Love Child: Did someone order a Plot Device? Laura: Well I'll be damned. Brand: We could still date! Brand's Secret Love Child: *sad eyes* Please marry my dad! Laura: Oh, FINE. I will. 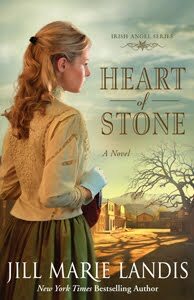 The Word: First off, I would like to thank Jill Marie Landis and her publicist for offering me a free copy of her Inspirational romance Heart of Stone, the first in her Irish Angels series. I have to say I was a little nonplussed by the title of the series. I don't really understand the focus on the characters being Irish - it doesn't really affect the protagonist's outlook, religion, or behaviour. That's just a quibble, however. Heart of Stone is not a terrible romance. I may be damning it with faint praise, but it does have a lot of good things going for it and avoids a lot of the pitfalls I was expecting (especially after reading A Bride in the Bargain). However, it just didn't manage to be interesting. Life dealt Lovie Lane a crappy hand. There's really no other way to say it. Orphaned at the age of eleven in the disease-ridden Irish Channel of New Orleans with her three younger sisters, her cold-hearted uncle dumped her two youngest sisters in an orphanage while Lovie and her sister Megan went someplace entirely different: a brothel. A day later, Megan too vanished, leaving Lovie utterly alone. Years later, Lovie now goes by the name Laura Foster and owns a luxurious boardinghouse in the small town of Glory, Texas. To the townsfolk, she's a respectable and incredibly wealthy widow, but Laura feels like a fraud. Jill Marie Landis, to her infinite credit, doesn't whitewash Laura's past: she wasn't some idealized noble prostitute who only did it a few times to keep the barest of crusts in her belly, but an accomplished veteran and survivor who earned the majority of her fortune from it. While she holds a high standing the community, Laura shuns social contact. Inside, she considers herself fallen and inferior and dirty, unworthy of association with the decent, moral people of Glory. To her, even starting a friendship is akin to deception, for surely no one would want to befriend her if they knew the truth. However, she hasn't given up on looking for her three lost sisters (presumably the heroines of future books in the series), and she keeps up her respectable front and her boardinghouse in order to provide a refuge for them once she tracks them down. The fine balance of her life is rattled when Brand McCormick, the widowed preacher of Glory, takes a romantic interest in her. Although she likes him, very much in fact, she can't afford a relationship with him. Sooner or later the truth about her past is bound to get out, and Brand's reputation will go down in flames if it does. However, in a delightful twist, good ol' Fate trashes Brand's reputation first when a young man claiming to be Brand's son shows up during his service and accuses his father of abandonment. In a nice narrative parallel, Laura finds herself defending Brand as the citizens of Glory fight over whether their preacher should be forgiven for an 18-year-old sin or tarred and feathered. This smaller, more manageable Big Dirty Secret strengthens the equality of the protagonists and makes the release of Laura's pent-up guilt and shame more believable, so that she's better able to handle the fallout from her own Big Dirty Secret. Another thing I liked was the depiction of religion. Naturally, it's very important to Brand, and this comes through well, but I especially appreciated the notion of religion as it relates to the heroine, who is an atheist. Yup - she doesn't believe in God. Thankfully, she's not treated to a preachy sermon (although probably because she doesn't make her atheism well known), and neither is she given a giant Road-To-Damascus revelation about God's existence either. Her introduction to God is subtly played and quite personal - her admiration for Brand is part of why she makes an attempt, but mainly it's thanks to her own quiet exploration and curiosity. And even then - she's not an enthusiastic, scripture-quoting convert by the end of the novel, merely someone who's more willing to accept God into her life. While the realism and the narrative plot parallels were quite good, this novel wasn't perfect. One of the flaws, I felt, was the reason for Laura's atheism. Part of it is due to her tormented childhood and how understandably difficult it is for Laura to reconcile the idea of a benevolent deity with the trauma she suffered - I get that. I do. But the novel also suggests that a large part of her atheism is just plain ignorance, and the fact that she'd never even picked up a Bible or heard a single Bible story growing up. Laura doesn't even know the story of Noah's Arc. Hello, if she was raised until the age of eleven by lower-class Irish parents in 1840s Ireland, she would have picked up some religion, she would have heard Bible stories. She might not have believed it or understood it, but religion would have been in her life - it just would have been Catholic. It's okay to have Catholic-raised characters lose their faith and then convert to Protestantism, Jill Marie Landis. I don't find that offensive - but I do find subverting historical accuracy in order to keep Catholicism out of a religious narrative offensive. Another flaw was the writing style. Jill Marie Landis definitely belongs to the Tell-Instead-of-Show School of Flawed Writing and she demonstrates this fairly early on page 25 when Laura notes Brand's "hands were not the hands of a man who shied away from hard work." Meaning? Show, don't tell! It gets worse, when, at the end, Landis decides to Tell instead of Show Brand's Big Moralizing Speech, under the excuse that Brand is so impassioned he doesn't remember what he said, only that it was awesome and about love and forgiveness and stuff and people in the audience cried. Lame. Lastly, our hero. I liked Laura, our heroine. True, I felt that for a survivor of her calibre she could have shown a bit more grit and been a little less "This is why I can't have nice things," but her character seemed genuine and her past wasn't watered down. Brand, on the other hand - he's too nice. Too nice and too understanding and too forgiving. In other words: boring. Other than a told-instead-of-shown "carousing past," a half-Cherokee love child (whom he instantly accepts with open arms), and a tendency to use his adorable and emotionally-fragile motherless children to score dates with chicks, he didn't have any flaws. He doesn't have a temper, he doesn't misunderstand things, he doesn't lash out or get frustrated. You can be a genuinely good, religious man and still make mistakes, but Brand just makes all the right moves and as a result has about as much spark as one of those Japanese body-pillows with a face on it. As a result, the development of the romance is pretty one-sided, as Brand is so perfectly forgiving, understanding and accepting (and totally in love with Laura) that Laura's personal development is the only real obstacle to the HEA. This lopsided development made a lot of the book pretty tedious and as a I result I didn't really enjoy it as much as I might have if Brand had had a little more life to him. That being said, this novel has good narrative drama, an intriguing heroine, and a gentle but no less genuine take on religion. Except for the one or two points I mentioned, the story is realistic and doesn't ask for a lot of suspension of disbelief. I liked this one a wee bit more than you did - but we agree on quite a bit. I really liked that Brand had a secret past as well, because if it had been heaved all on Laura's shoulders I probably would have gotten really annoyed. I also thought Laura was definitely the more well-drawn of the two characters. Brand is, well, pretty bland. You're right - a little fire would have been nice. I also enjoyed this one and my review will be posted tomorrow, but with a higher grade. I don't read inspirational romance that often but the way Jill wrote Heart of Stone, I would recommend it to anyone who wants to read a sweet romance about forgiveness and redemption. The first chapter really grabbed me and almost brought me to tears. Ladies, are you seeing a trend? The next book by the author of In for a Penny (Rose Lerner) is about a woman who worked in a brothel and eventually was able to leave and start a successful coaching house. Plus on Borders Romance Book Chat, the five Harlequin Historical authors who did the round-table discussion ... one of those stories is former working girl (or does the hero discover her working?). The HH is an anthology of 5 e-novellas, now to be in print. Anyhow, what gives? Isn't this unusual?